State District Judge Maria Jackson stood up behind a shaky makeshift bench in the basement of the Harris County jail and came eye-to eye with an inmate in an orange jail uniform 3 feet away. The Houston Chronicle reports the inmate and his lawyer took three steps back to huddle, wedged in between eight other inmates along a cinder-block wall. Brief and overcrowded procedural hearings like this basement exchange have generated hundreds of pleas and dismissals, dubbed “Harvey deals,” in what has become the new normal for the state’s largest criminal justice system in the wake of Hurricane Harvey’s destruction. 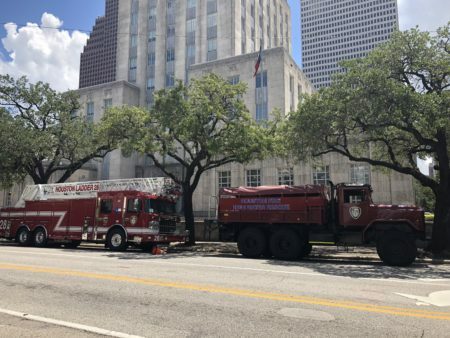 The county’s criminal courthouse, a 20-story skyscraper that sits on the banks of Buffalo Bayou on the north side of downtown Houston, remains shuttered after it was flooded with 4 feet of water during the August storm. Damage extended throughout the building after water seeped in through the walls and pooled in the basement, triggering a malfunction in computers that regulate the water pressure. This in turn sent water gushing through sinks, toilets and water fountains on some upper levels, causing pipes to burst and flooding courtrooms that wouldn’t otherwise have been damaged. Now, two dingy and crowded classrooms-turned-courtrooms locked behind clanking steel doors in a jail basement have become the epicenter of an ever-growing docket of felony criminal filings. In a small room in another jail building, the judges and prosecutors handling misdemeanors are dealing with the same pressures. The nearby Jury Assembly Building, which was built underground with a park on top, was destroyed. Another 111 county buildings sustained $127 million in damages, according to initial estimates. County Engineer John Blount said he couldn’t begin to estimate how much repairs and flood-prevention measures at the main courthouse would cost. But he said it will likely remain closed for at least another six months, with court staff and other county employees gradually moving back into their offices and courtrooms as work is completed over the next year. For now, criminal trials are being conducted in the nearby civil courthouse. The county is following FEMA guidelines and will be hiring consultants this month, he said. Harris County Judge Ed Emmett said the storm affected all aspects of county government. “Obviously the county is working overtime and as hard as possible to get things up and running and as close to normal as we can, but it’s still going to take some time,” he said. 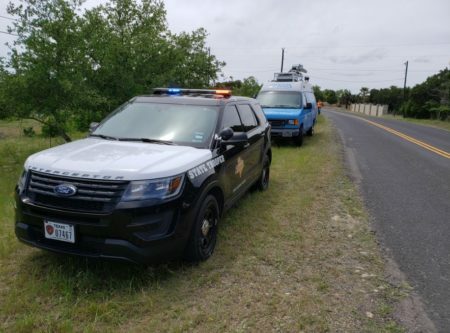 District Attorney Kim Ogg — whose staff of 700 has scattered to nine different locations, some as far away as the Galleria area — said her office is contending with the challenge. In a ballroom-sized area on the top floor of a downtown office building, almost 90 of Ogg’s 300 prosecutors work elbow-to-elbow contacting victims, witnesses and defense attorneys to hash out misdemeanor cases. Instead of being an elevator ride away from court, prosecutors are working blocks or even miles away. “It really looks like a giant telemarketing company,” Ogg said of the makeshift misdemeanor bureau. The DA’s office lost workspace on six floors in the criminal courthouse, and Ogg said the effort of transporting files to court is now driving an initiative to go paperless. During an afternoon in late October, Jackson presided over a jailhouse courtroom packed with more than 20 inmates, sheriff’s deputies, court staffers, prosecutors and defense lawyers. At one end of Jackson’s bench, a staffer handed out forms kept on an end table, fashioned from a pair of stacked milk crates. Attorneys signed forms to reschedule court hearings and piled them on the lid of a trash can. The judge, a soft-spoken woman with silver spectacles balanced on her nose, said she was initially concerned about laying down the law to suspects just an arm’s length away. In the adjacent courtroom, state District Judge George Powell shepherded cases through his criminal docket. Every weekday, there are two docket calls in each of the pair of classrooms where two of the 22 felony judges alternate in holding court from a “bench” consisting of two chipped wooden desks lined up end-to-end. They are trying to move the cases of inmates charged with the most serious crimes waiting to go to trial. Within earshot of a half-dozen other inmates, criminal suspects have their only opportunity to resolve their case for at least a week, until the court to which their case is assigned holds another hearing. Defense lawyers in sneakers shuffle between the courtrooms and a “bullpen” set up in the jail’s law library. In the bullpen, prosecutors and defense attorneys work out plea deals. Once an agreement is reached, the defense lawyer, the inmate and the prosecutor stand shoulder-to-shoulder in front of the judge who can approve the bargain. Defense lawyer Carlos Rodriguez said the parties are trying to make the best of a tough situation. “Because they can’t have court every day, when the inmates get to come to court, they really take advantage of it,” he said. Other lawyers said the crush of criminal cases has caused judges and prosecutors to evaluate their dockets with an eye toward getting rid of as many cases as possible. Ogg confirmed that in the wake of the storm, her top lieutenants reviewed about 600 low-level drug cases in a feverish bid to make plea deals. Ogg said her office sought to expedite state jail felony drug cases, which typically involve possession of small amounts of cocaine or other drugs. Until the storm, the courthouse housed the 22 state district courts presided over by felony judges like Jackson and Powell, as well as 16 misdemeanor courts. Each day, sheriff’s deputies and detention officers escorted more than 800 inmates from the two nearby jails to courtrooms. A covered walkway extends from beneath the jail, spans Buffalo Bayou and leads to the center of the courthouse at 1201 Franklin. In the core of the building, banks of secured elevators move inmates to dozens of holding cells in courtrooms from the eighth floor up to the 20th. Historically, about 70 percent of the 9,000 inmates in the jail are waiting trial, although those numbers have been going down because of recent bail reforms. Most will resolve their case with a plea deal. But the number of criminal filings, which tops 100,000 a year, keeps going up. Now, deputies move 300 to 450 inmates a day from jail cells to one of seven locations, including the jail basement or substitute courtrooms in the civil, juvenile and family courthouses. Judges and defense attorneys praised Sheriff Ed Gonzalez’s staff for maintaining an orderly process. “It’s been a test, but it seems like, so far, we’re passing the test,” said HCSO Chief Deputy Darryl Coleman. Across the bayou from the jail complex, the county’s 17-story civil courthouse has been pressed into service with the civil and felony criminal courts doubling up in courtrooms to accommodate suspects who are out on bail. It is still crowded, but defendants and lawyers are able to do their business in traditional courtrooms. In a top-floor conference room divided into thirds by glass walls, big screen TVs equipped with cameras show what’s going on blocks away in the basement of the jail. The room is carpeted, with chairs and several tables. It’s a place for suspects’ families to view what’s going on without trying to get into the jail courtrooms. On a Friday morning in October, an older man with a hearing aid focused on the TV and waited for his son to appear, hoping to see the case resolved. As his adult son approached the judge and signed a form on the makeshift bench, the father stood close to the TV to hear what was going on. A minute later, an attorney held the form up to the camera to show the case had been postponed yet again. The older man leaned toward the closed-circuit TV to make out the date scribbled on the yellow form. Then the father, who declined to give his name, gathered up his hat and newspaper and sighed. “Another reset,” said the man, who shook his head and left.